Following on our discussion of new features in version 1.3.1 of Cart Viper our advanced ecommerce DotNetNuke module we are going to highlight the new category image and description support. In order to output them in the catalogue we are going to use the advanced templating system Cart Viper employs. Each page within Cart Viper is made up of a number of .htm files that contains HTML and “tokens”, when Cart Viper makes a page it merges the HTML and replaces the tokens with data. 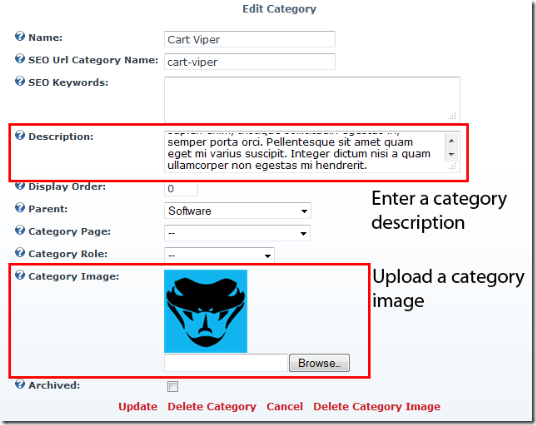 This templating system is used throughout Cart Viper and empowers the store admin to create advanced page layouts, a further key advantage is due to the fact each portal has its own templates it is possible to create completely unique stores for each of your portals on your DNN installation. For more information on the token system used within Cart Viper please consult our user guide. 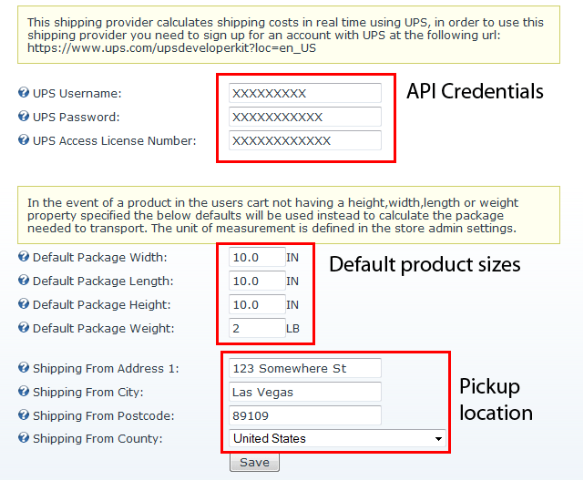 Another major improvement to Cart Viper our DotNetNuke ecommerce module is the integration into the UPS shipping calculations API, allowing real time calculations of shipping costs based on the items in the customers cart. 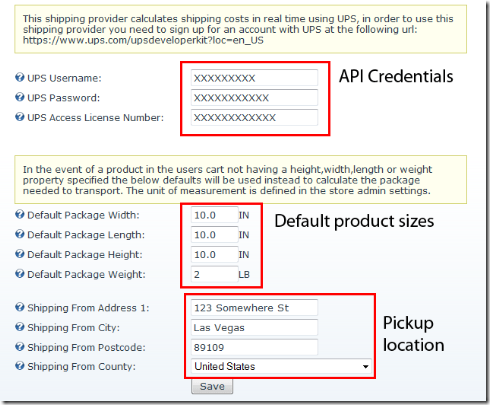 UPS calculates the cost of the shipment based upon the size and weight of the items being sent, as you can see above we have defined defaults for package size and weight. In the event that a product does not have a length, width, height or weight defined we will use the above defaults. Furthermore the address you enter above must be the address UPS will collect your packages from, as all shipping costs are calculated from the above address to the customers shipping address. 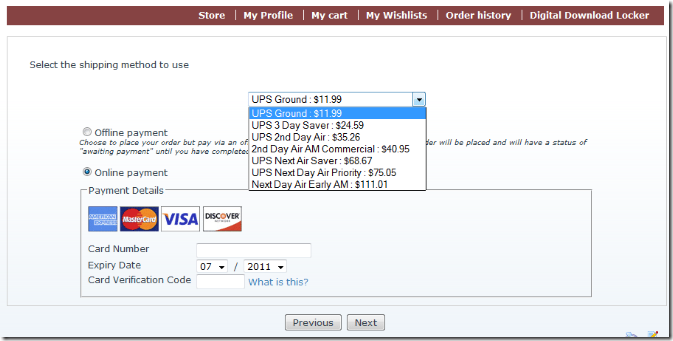 Enable / disable shipping to be calculated on an order. Real time shipping calculating via FedEx, USPS and UPS. Define a standard shipping rate on all orders. Define an unlimited amount of shipping rates by cart weight, speed of delivery and shipping destination. Define an unlimited amount of shipping rates by cart subtotal, speed of delivery and shipping destination. Define an unlimited amount of standards of shipping for each country e.g. saver, super saver, next day, etc. Define the shipping charge as a percentage of the cart sub-total. 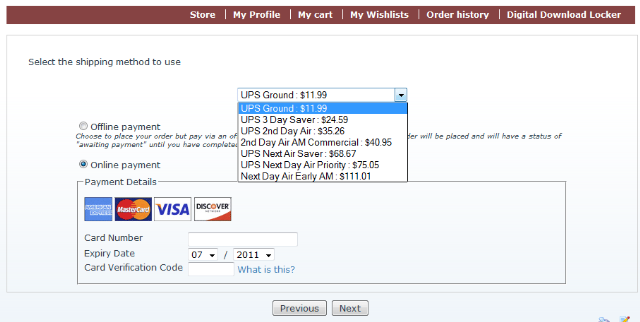 If no shipping rates are defined for a users country, customers are prompted to contact the store for a quote. Optionally charge VAT or tax on shipping costs. Optionally define a product as "free shipping" so regardless of the shipping rules in place, this product will not incur a shipping cost. In store pick up option. 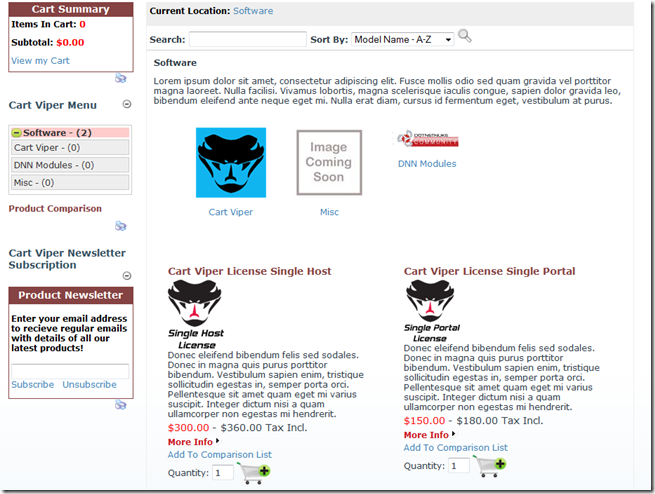 Feel free to contact us if you have a shipping model that is not covered by Cart Viper. 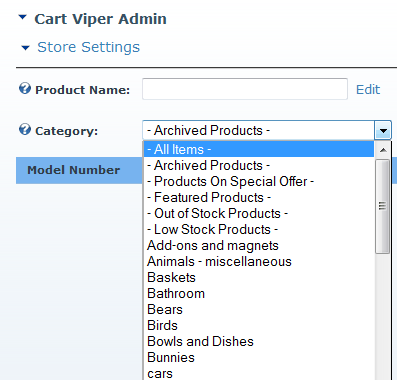 Within the Store Admin pages of Cart Viper we’ve made it easier for the store owner to find particular types of products. Archived Products – Products which are marked as archived and not available in the store front. Products on Special Offer – Display only products which are on special offer within the store. 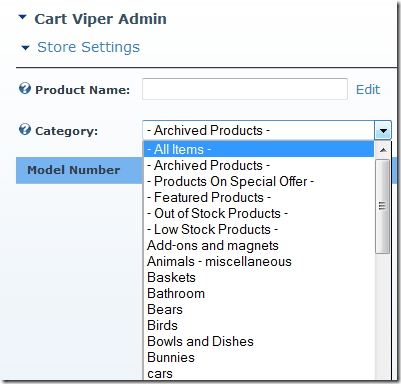 Featured Products – Limits the product list to display products which have been marked as featured. Low Stock Products – Shows products with stock levels running low. We are already working on the next release of Cart Viper with even more features and improves. If you have an idea for a feature that you would like to see included in the next release please get in contact. We are constantly trying to improve Cart Viper our Ecommerce Store for DotNetNuke, one of the new improvements in release 1.3.1 was an improve admin menu. Previous we had all the Store Admin options listed as hyperlinks on the Admin page, however there is only so much room and we couldn’t group related options together. We’ve followed the current trend of using a mega menu style menu to allow us to group the options together and also to take up much less real estate on the screen. We hope you like the new feature, we’re already working on the next release of Cart Viper which will have even more improvements and features. Real time shipping calculations provided by UPS. Improved store admin menu layout. Support for Thailand Baht currency. Improve product management filter product selectors. As ever we will be doing follow up blogs highlighting each new feature.